Note: Don't forget to click through to enter the giveaway at the end of the post! 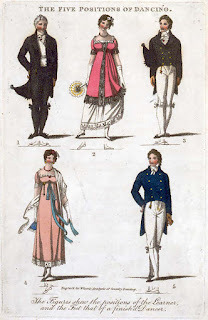 In Part One of this series, ("Undress, Half-Dress, Full Dress, Ball,") we discussed the categories of costume which were part and parcel of a fashionable regency belle's wardrobe. This month we focus on Ball Dress exclusively. 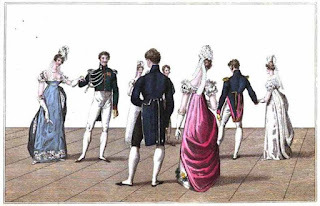 While many sorts of entertainments took place during the whirl of a Regency London Season, attending balls was quite possibly the apex of excitement for many. Assemblies were balls open to the public, often for a nominal fee. 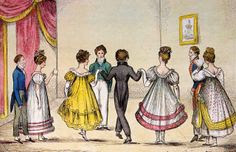 Almacks, that most exclusive venue, also required ball dress, for what was it but a tightly controlled ball, replete with refreshments, dancing, and opportunities for conversation? 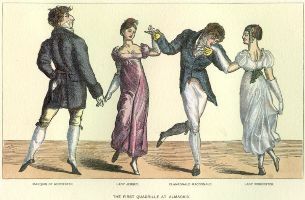 Otherwise, most balls were private affairs, requiring mere, ahem, invitations. Procuring these invitations was every chaperon's and debutante's challenge. "Invitations," exclaims Mrs. Bentley, in Before the Season Ends, "are everything. Without invitations, we are nothing!" The following excerpt (also from Before the Season Ends) shows how Mrs. Bentley, chaperon to her niece, debutante Ariana Forsythe, prepares the girl for an exclusive ball. Due to an amazing circumstance, Ariana will appear on the arm of the Paragon, Mr. Mornay, the handsome, fabulously wealthy, most sought-after gentleman in London. 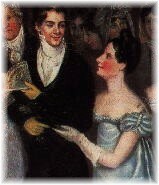 ...Mrs. Bentley sought out her niece to direct her remaining hours in preparations for the ball that night. It seemed outlandish, but she insisted Ariana soak in a hot tub, and then quickly into and out of a cold one. She called this "polishing the skin." 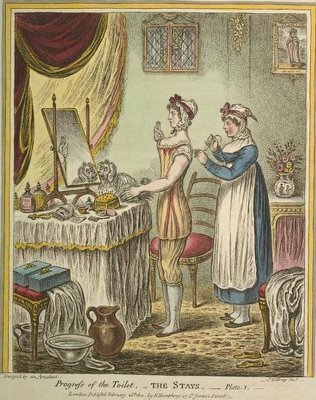 Harrietta (the lady's maid) then took over, trimming the nails on her feet and hands, and supplying her with an enormous array of vials and lotions, perfumes and powders and other solutions. Some were for her face and neck, others for her hands, elbows, and even her feet! Ariana was allowed a small meal, followed by tea. 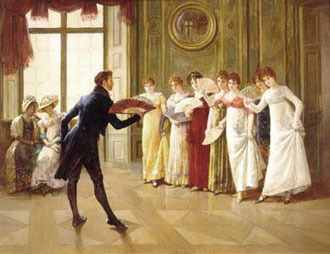 Then, to her surprise, Mrs. Bentley announced it was time to "earnestly prepare for the evening." Ariana had to wonder what they had been doing all along, if not earnestly preparing for the evening! 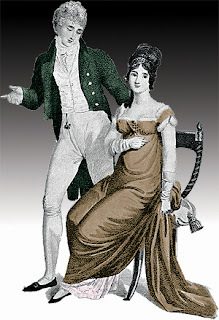 Still, Mrs. Bentley insisted upon loaning her a matching set of jewels consisting of a necklace, earrings, brooch and bracelet. 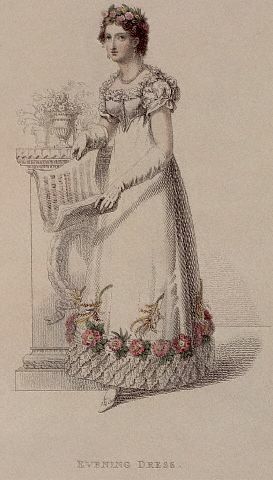 And, as a last dignifying element, a tiara: a delicate, lightly embellished headpiece, which was placed gingerly over her head and fastened into place with pins. 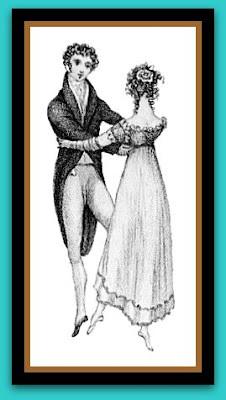 When at last she stood quietly resplendent in a pale pink gown of satin and net, with elegant white gloves that reached past her elbows and pale pink satin slippers upon her feet, even Mrs. Bentley had to smile. "You do me credit, my gel," she said, almost affectionately. 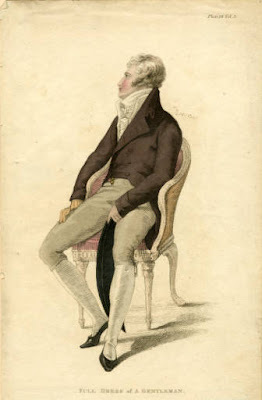 "Even Mornay will be smitten, I daresay, eh, Harrietta?" Oh, yes, ma'am!" breathed Harrietta, fully as pleased with the way Ariana had turned out as her mistress. "So tall and strikin' as miss is, just like a princess!" And what were the results of such arduous preparations? 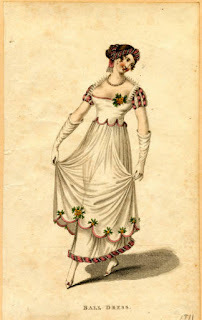 Enjoy the following illustrations as examples of a Regency belle in ball attire. Note that gentlemen also had to wear Full Dress, which necessitated breeches (rather than pantaloons). 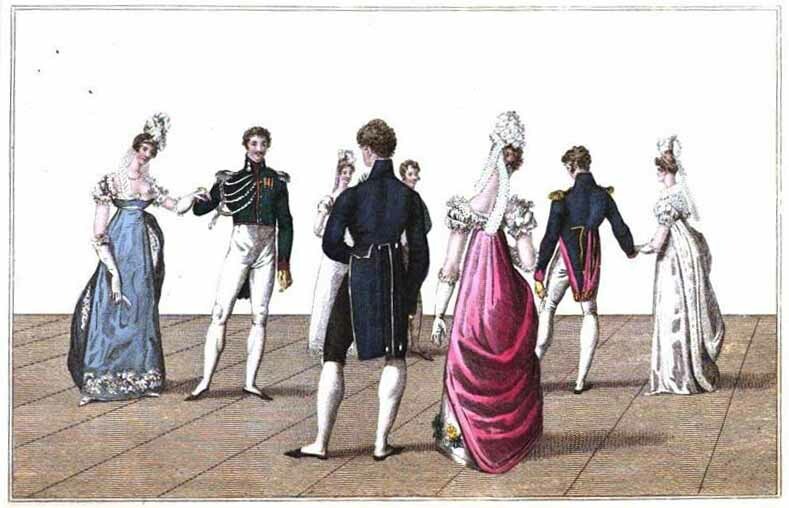 "The First Quadrille at Almack's"
"The Five Positions of Dancing"
Did you enjoy this peek at Regency Ball Fashions? 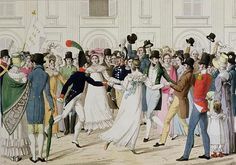 Jane Austen lovers often hold a Regency-style ball at the end of their annual galas. Look up JASNA.org for info. on this year's event. Linore Rose Burkard is best known for historical romance novels with Harvest House Publishers, and now writes YA/Suspense as L.R.Burkard. 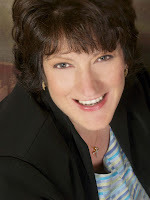 Linore teaches workshops for writers, is a mother of five, and still homeschools her youngest daughter—preferably with coffee in one hand, and an iPad in the other. GIVEAWAY GOING ON! Enter to win a giveaway of one of Linore's newest books, PULSE (YA/Apocalyptic Suspense) right now at Amazon.com. Entries accepted until July 23rd, but time is running out. Enter now! Also--please tell a friend. SIX winners will be chosen! Another wonderful post filled with great pictures. Thanks for sharing. of knowledge! Thanks for sharing.